After the government shut down Greek Radio-Television (ERT) in 2013, the workers resisted and took ERT into collective self management and continued broadcasting for 2 years. On June 11, 2013, as part of its austerity measures, the Greek government of Prime Minister Antonis Samaras closed down the state-owned ERT radio and television station. There was no debate or vote in parliament; overnight, the entire staff was laid off by government diktat. 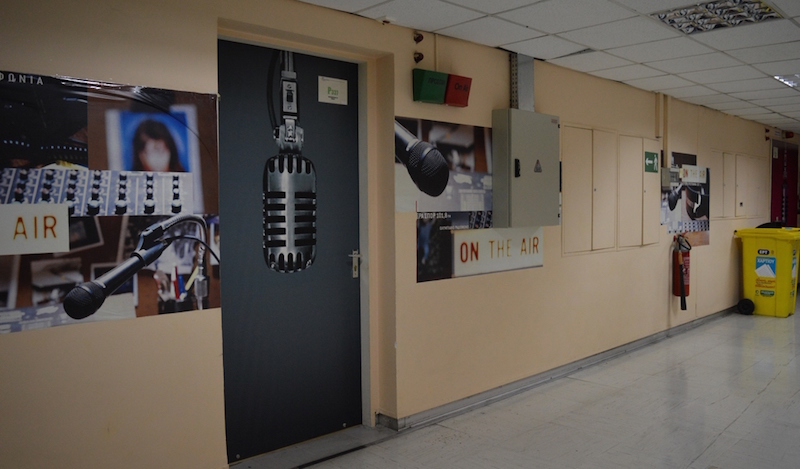 In response to the closure, the workers decided to occupy the building and for two years they functioned as a self-managed public broadcaster, under the name of ERT Open. 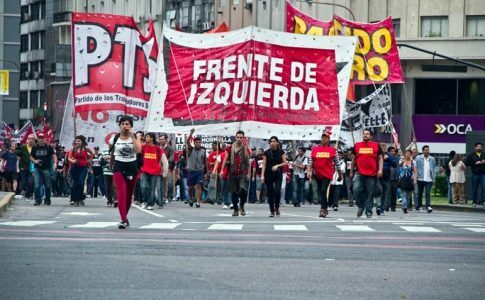 Despite being totally boycotted by the government and evicted from their studios by the police, they were able to continue broadcasting from various other locations and provide a platform for workers battling austerity. 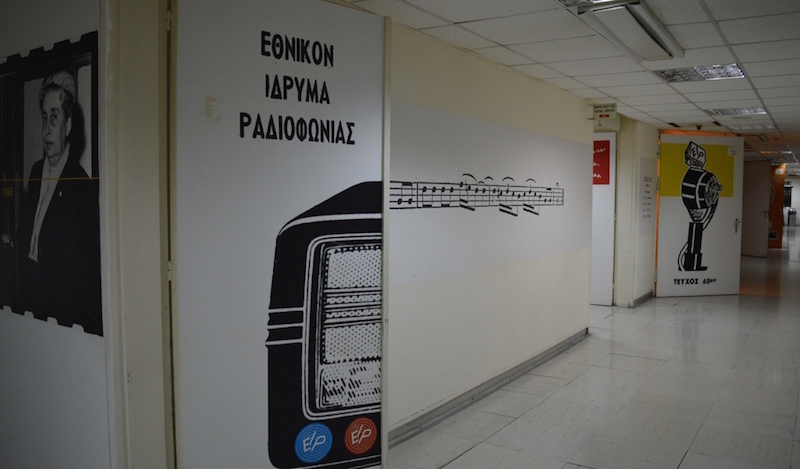 Their struggle and commitment to a pluralistic public service broadcaster was rewarded when the current government was forced to reopen ERT on June 11, 2015, two years to the day since its closure. At present ERT is under threat and workers are facing job losses. We visit the main ERT building in Athens to met Nikos Tsibidas, the spokesman during the occupation, who told us about their struggle. How many people work at ERT? 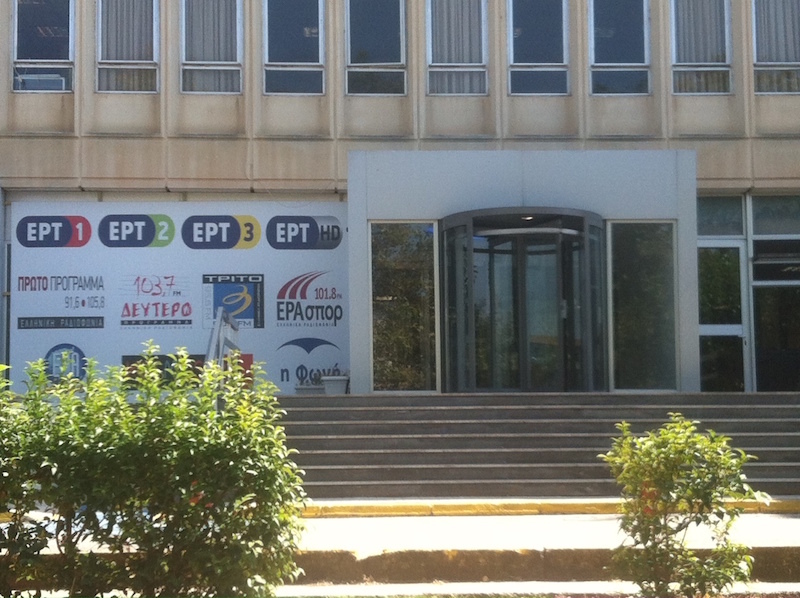 When ERT was closed down by the previous government in June 2013 there were 3,000 workers but currently there are 2,000. Some people didn’t want to return to work after two years, some retired and some left the country. Sadly, 18 former colleagues died, half of them committing suicide because they lost their jobs. 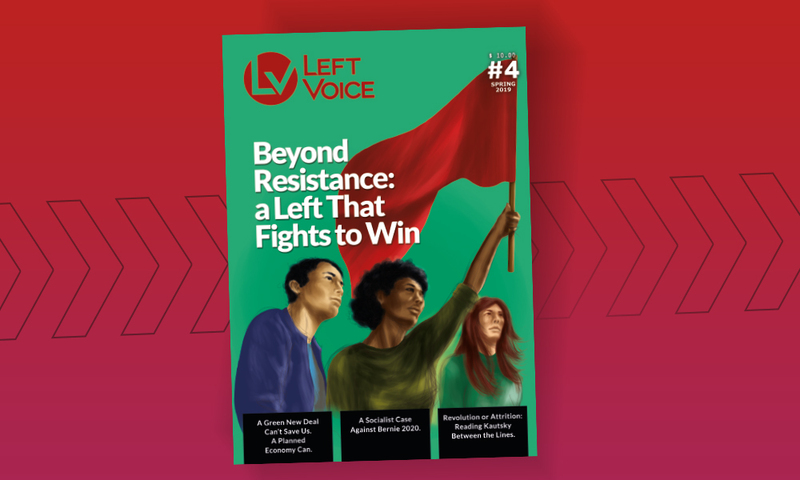 Could you summarise the ERT struggle for Left Voice? The two-year strike was split into two periods. The first period was between June and August 2013, during which, despite differences of strategy in our own ranks, we maintained a united front against the government. The intention of the management was to divide us. 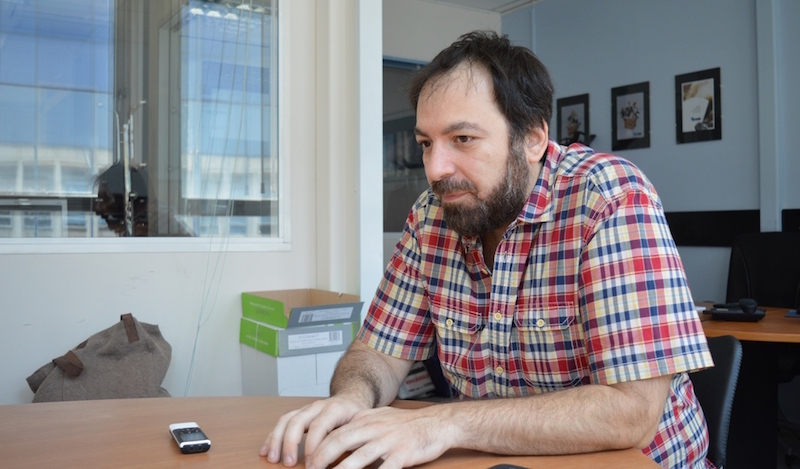 The second period began in August 2013 when the government said that it wanted ERT staff to work at a new channel run by the private broadcaster Nerit. That proposal split the workforce; about 600 workers left to work with the government, the rest stayed and continued broadcasting the original channels from here, from this building in Athens, and from another TV station in Salonika. In November 2013, the police entered the building. This building was our main production site – every technical aspect of the programmes was done here. So it was a major blow for us to lose it. There were about 50 of us guarding the building when armed police entered at 5.30am. We could not offer any resistance, but a couple of hours later we regrouped and rented a place just across the street. We set up a studio and sent people to the north of Greece to keep the other TV station in Salonika on the air. We reinforced the guards and in this way were able to keep 19 stations broadcasting live. We also organised news bulletins from the street outside the ERT building. How did you maintain yourselves? Did you get salaries? We kept the struggle alive with solidarity funds set up by the Journalists’ Union and the Technicians’ Union, and with food, petrol, etc, donated by supporters. In Greece, the unemployment benefit of between 400 and 500 euros per month only lasts for one year, so the support provided by family and friends was crucial. How did you organise the occupation? During the struggle there were about 600 people involved in the self-organising. After the main split in August 2013 we completely changed our way of working, implementing a more horizontal structure and organisation. The experience over two years showed that in some places this worked very well, in others not so well. The model worked well in the smaller towns where the radio stations are based in the community. The people there organised very quickly, assemblies were more dynamic, and the communities had more direct communication with the workers. In big cities like Athens and Salonika the model was not so successful. When we started to organise ERT Open it was clear that if a person in charge of a particular department was well respected by the workers and remained loyal to the struggle, this person would be chosen as a ‘chief’ or ‘coordinator’ during the self-organisation. There was no hierarchy, there were no bosses, and all strategic decisions were taken in the assemblies. This was not an easy project. We tried to develop a hybrid system to get things done. Because news bulletins are produced to a very tight schedule, it was necessary to choose a person to be in charge who was authorised to take decisions. No-one would interfere during the preparation of the news bulletin, but differences would be discussed after it had been broadcast. To accomplish this on a macro scale is not easy. Did this new form of organisation affect the way in which you delivered the news? Yes, it was a break with the way we have worked for the last 25 years. We are trying to keep this way of working, not only because the process of making the news was different, or because we liberated ourselves from self-censorship and felt free to report on anything, but because the main factor that changed the way the news was told was the input from society. The people who left didn’t want to open the station to society. But citizens are the best journalists as was shown by the way in which local communities participated in the creation of radio programmes. We reported news differently from the mainstream media. 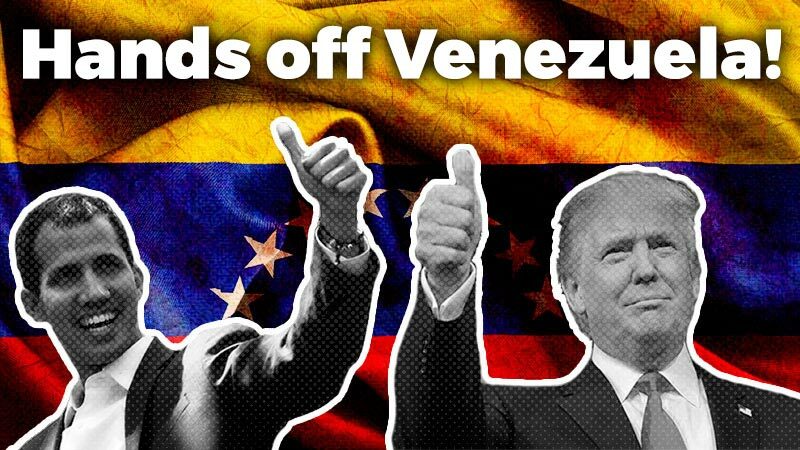 We would talk about strikes, demonstrations, the chaos in the streets, etc. We talked about people without jobs, about kids without food and fainting in the schools, about not being able to pay the electricity bills. The commercial stations say that Greeks are lazy, that we brought this crisis on ourselves, that the country needs reform, that we have to be patient, and that strikes and demonstrations keep tourists away. We took a different line and people gradually started to listen. Even when the government ordered the closure of our satellite service – we were renting space from private companies outside Greece in order to broadcast via satellite – we had an audience of half a million every day. This was because we were talking about people’s everyday lives, about the cuts and lay-offs that they were experiencing. We had to take sides – and that was why the state was very hard on us. We made a lot of sacrifices and managed to hold on to all our buildings except this one. ERT had 115 transmitters in the mountains and we controlled 50 of them. We were like media guerrillas, travelling to the mountains in the middle of the night by motorbike. If we had been caught, we could have faced charges. What was the situation during the elections . . . 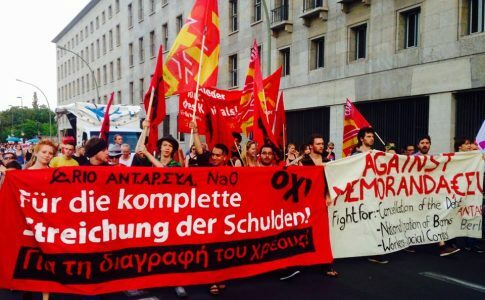 The station didn’t support Syriza – we didn’t say vote for Syriza or vote for the left. We criticised the government and invited all parties except the neo-Nazi Golden Dawn to the election debate. We invited politicians from the former government, the Communists and the Greens.
. . . and the referendum? As you can imagine, most of us as individuals were voting ‘Oxi’ in the referendum. All the mainstream media were for a ‘Yes’ vote – they said that every disaster imaginable would happen if the Noes won. But despite the overwhelming ‘No’ vote, the political system showed clearly a few days later that it cannot serve this country. I am not saying that 60 per cent voted to leave the euro, but a great proportion – in my opinion half – were prepared for anything. What they needed was someone to tell them that, although it would be a hard road, there was a plan. But this is a coup – a decision by a small power centre that has decided the future of the country. Could you give us some examples of ERT’s solidarity with other workers’ struggles? We supported the struggle against water privatisation in Salonika. We provided the coverage in Crete against the dumping of nuclear waste. We gave radio and TV space to teachers to make their own programmes. Of course, we supported the struggle of the Vio.me factory in Salonika under workers’ control, with whom we have very close links. 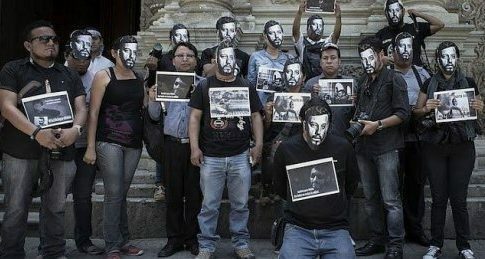 We were first to report that the rapper Pavlos Fyssas had been killed by fascists, that he was a political activist, and that it was a political murder. We supported the hunger strike of the anarchist prisoner Nikos Romanos for his right to study inside prison. What are your biggest challenges at present? There is a lot of pressure on us because we are a public broadcaster. Our biggest challenges are to maintain our integrity, to work without bosses, to report the news without censorship, and to keep the station open to community involvement. The implementation of the third memorandum will probably mean new threats to the integrity of ERT and job losses. The Troika seeks to close down ERT and the government will try to reduce the staff. This struggle has not finished. We will write a new chapter in its history of struggle.